Philippine presidents including current President Rodrigo Duterte, have repeatedly called for the bells’ return. Now, President Donald Trump’s administration has agreed that bolstering the U.S. relationship with a key international ally outweighs concerns at home, even among Republican political allies. “History reminds us that all wars end. 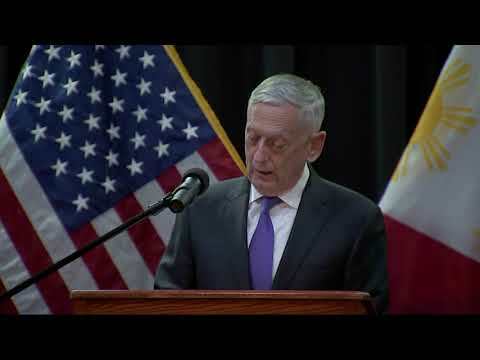 In returning the Bells of Balangiga to our ally and our friend, the Philippines, we pick up our generation’s responsibility to deepen the respect between our peoples,” Mattis said in a ceremony at the base. “To those who fear that we lose something by returning the bells, please hear me when I say that the bells mark time, but courage is timeless,” Mattis said. Wyoming’s all-Republican congressional delegation also opposes the bells’ return, saying in a joint statement released by Sen. Mike Enzi spokesman Max D’Onofrio that repatriation would set a dangerous precedent for other veterans’ memorials in the U.S.